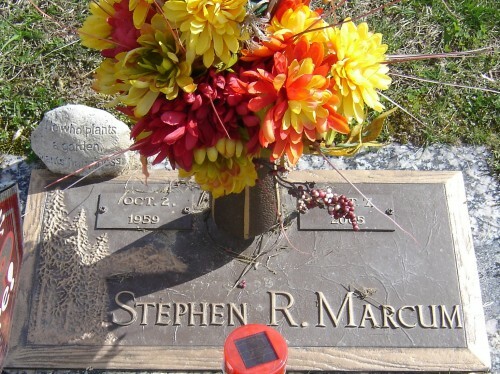 Sunday, October 11, 2005 from noon until 2:00 p.m.
Stephen Ray Marcum, age 45, of Chapmanville, Boone County, West Virginia, passed away at 10:30 a.m., September 7, 2005 at his home. He was a teacher for Boone County Schools. Born October 2, 1959, in Holden, West Virginia, he was the son of James P. Marcum and Lorain (nee Keith) Marcum. Brother of Mark Marcum and Lori Marcum. STEPHEN RAY MARCUM, 45, of Chapmanville died Wednesday, October 7, 2005. Services will be conducted at 2 p.m. on Sunday, October 11, 2005, at the Freeman Funeral Home, Chapmanville. Stephen Ray Marcum was a long-time employee of Kroger in Logan, West Virginia and Huntington, West Virginia. He was a teacher in Boone County Public Schools.